Interesting set of flavours; tart shell, originally proposed, was made with walnuts and oats. We liked it all right, but decided the next edition of the Roasted Cauliflower Tart will engage a different shell, maybe even take presence with out any shell at all? Toss the florets in olive oil and salt, then arrange evenly on the tray and roast for 30 minutes. Turn each floret over and return to the oven for 10 minutes, or until the florets are browning. Remove from the oven and set aside to cool while you prepare the filling and/or the shell of your choice. Warm the oil in a frying pan over a medium heat. Add the onions and saute for 5 minutes or until lightly browned. Add the garlic and cook for another 5 minutes. Turn the heat down low, add the salt, and continue cooking for another 10 minutes, or until caramelised. Stir in the turmeric, remove from the heat and transfer into a food processor. Add a quarter of the roasted cauliflower, the lemon juice, milk and a large pinch of black pepper. Blend until smooth and creamy, scraping the sides as necessary. 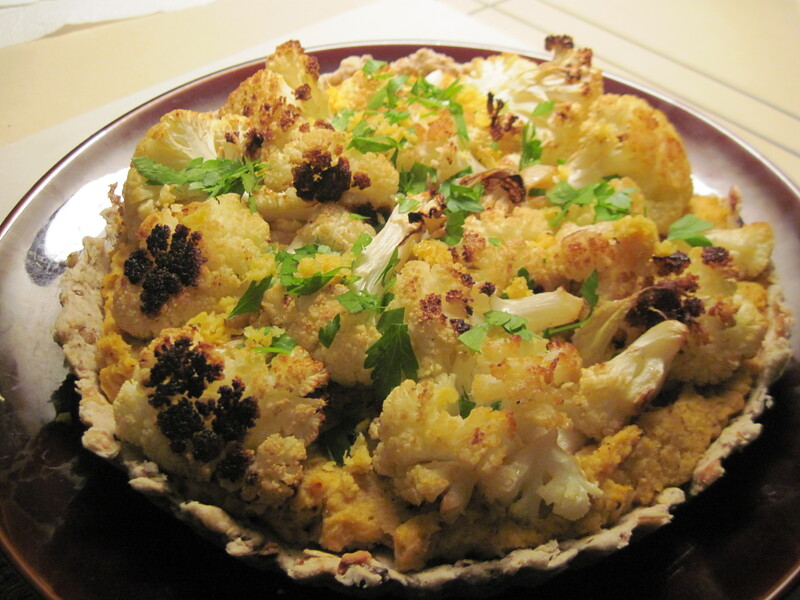 Spread the filling into the prebaked tart shell and arrange the remaining cauliflower on the top. Bake the tart for 30 minutes. Remove from the oven and allow to cool for 15 to 20 minutes before sprinkling with the lemon zest and parsley. Serve it slightly warm or at room temperature with a salad for a perfect spring meal or as a dip/paste with chips etc. Variation considered: Add some finely chopped anchovy fillets to the filling, after the paste is well blended.